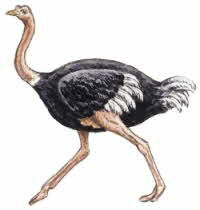 Ostrich brain was considered to be a delicacy at the time of Nero. Ostrich is a red meat that has a mild beef-like flavor and shrinks very little when cooked. It is very low in fat and cholesterol. Heliogabalus was a Roman emperor (204-222 AD) who was known for his culinary excesses. For one banquet he had 600 ostrich brains prepared.